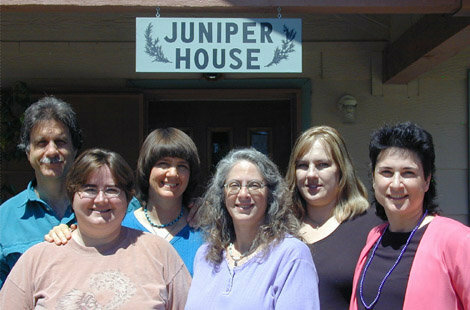 Juniper House - Therapeutic Massage, Bodywork, and Holistic Therapy at Juniper House in Glendale, Arizona. You Found It! Welcome to Juniper House! You Found It! Personalized, Professional, Caring Therapy . . . including . . . . .
Massage and Bodywork . . .
Craniosacral Therapy . . . Stretch Therapy . . .
Energy Balancing . . .
Juniper House is located in Historic Catlin Court in Downtown Glendale, Arizona. This friendly walking neighborhood offers a variety of shops and services in a charming old world setting. In keeping with the historic theme, Juniper House draws on age old traditions from a variety of cultures in its selection of products and offering of holistic therapies. Our services include therapeutic massage, integrative bodywork, pain relief and prevention, hypnotherapy, meditation sessions, craniosacral therapy, and more. Find more information on our practitioners page on this website. Services are provided by a consortium of professional therapists and practitioners who share this lovely healing space. Introductory information about us and our services is provided as part of this site. On our practitioners page, you can get an idea of who we are and what we do. Then, to find out more, please contact your individual practitioner, or use the form below. For more information about Juniper House products and/or services, or for information about our therapy rooms for rent, please contact Marian at 623-363-4857. Hope we can be of service! Thanks for visiting our page!